Rutgers was designated The State University of New Jersey by acts of the New Jersey Legislature in 1945 and 1956. The three campuses of Rutgers are in (1) New Brunswick and Piscataway , (2) Newark and (3) Camden . The Newark campus was formerly the University of Newark, which merged into the Rutgers system in 1946, and the Camden campus was created in 1950 from the College of South Jersey. Rutgers is the largest university within New Jersey's state university system, and it was ranked 54th in the world academically in a 2008 survey conducted by the Institute of Higher Education at Shanghai Jiao Tong University . The university offers more than 100 distinct bachelor, 100 master, and 80 doctoral and professional degree programs across 175 academic departments, 29 degree-granting schools and colleges, 16 of which offer graduate programs of study. Shortly after the College of New Jersey (now Princeton University) was established in 1746, ministers of the Dutch Reformed Church, seeking autonomy in ecclesiastical affairs in the American colonies sought to establish a college to train those who wanted to become ministers within the church. Through several years of effort by Rev. Theodorus Jacobus Frelinghuysen (1691–1747) and Rev. Jacob Rutsen Hardenbergh (1736–1790), later the college's first president, Queen's College was chartered on 10 November 1766. Established as the trustees of Queen's College, in New-Jersey in honor of King George III's Queen consort, Charlotte of Mecklenburg-Strelitz (1744–1818). The charter was signed and the young college was supported by William Franklin (1730–1813), the last Royal Governor of New Jersey and illegitimate son of Benjamin Franklin. The original charter specified the establishment both of the college, and of an institution called the Queen's College Grammar School, intended to be a preparatory school affiliated and governed by the college. This institution, today the Rutgers Preparatory School , was a part of the college community until 1959. In its early years, due to a lack of funds, Queen's College was closed for two extended periods. Early trustees considered merging the college with the College of New Jersey, in Princeton (the measure failed by one vote) and later considered relocating to New York City . In 1808, after raising $12,000, the college was temporarily reopened and broke ground on a building of its own, affectionately called "Old Queens " designed by architect John McComb, Jr. The college's third president, the Rev. Ira Condict, laid the cornerstone on April 27, 1809. Shortly after, the New Brunswick Theological Seminary , founded in 1784, relocated from Brooklyn, New York , to New Brunswick, and shared facilities with Queen's College (and the Queen's College Grammar School , as all three institutions were then overseen by the Reformed Church in America). During those formative years, all three institutions fit into Old Queens. In 1830, the Queen's College Grammar School moved across the street, and in 1856, the Seminary relocated to a seven-acre (28,000 m2) tract less than one-half mile (800 m) away. Rutgers was designated the State University of New Jersey by acts of the New Jersey Legislature in 1945 and 1956. Shortly after, the University of Newark (1935) was merged with Rutgers in 1946, as was the College of South Jersey in 1950, and these two institutions were transformed into Rutgers University's campuses in Newark and Camden . On September 10, 1970, after much debate, the Board of Governors voted to admit women into the previously all-male Rutgers College . New Jersey Governor Jon Corzine expressed interest in reviving a plan to merge Rutgers University with the New Jersey Institute of Technology (NJIT) and the University of Medicine and Dentistry of New Jersey (UMDNJ), a plan which has received support from Rutgers University president Richard L. McCormick, but is unpopular with alumni. The New Brunswick-Piscataway Campus (or Rutgers-New Brunswick) is the largest campus of Rutgers; it is the site of the original Rutgers College. It is spread across six municipalities in Middlesex County, New Jersey , chiefly in the City of New Brunswick and Piscataway Township. It is composed of five smaller campuses, and a few buildings in downtown New Brunswick. The original and historic College Avenue campus is adjacent to downtown New Brunswick, and includes the seat of the University, Old Queens. On the other side of the city, Douglass Campus and Cook Campus are adjacent and intertwined with each other, and are often referred to collectively as the Cook/Douglass Campus. Cook Campus has extensive farms and woods that reach into North Brunswick and East Brunswick Townships. Separated by the Raritan river are Busch Campus , in Piscataway, and Livingston Campus, also mainly in Piscataway but including remote sections of land extending into Edison Township and the Borough of Highland Park. The Newark Campus (or Rutgers-Newark ), consists of 8 undergraduate, graduate and professional schools, including: Newark College of Arts and Sciences, University College, School of Criminal Justice, Graduate School, College of Nursing, School of Public Affairs and Administration, Rutgers Business School and Rutgers School of Law - Newark. As of 2007, 6,503 undergraduates and 3,700 graduate students (total 10,203) are enrolled at the Newark campus. Winter at Old Queens, the oldest building at Rutgers University in New Brunswick, New Jersey, built between 1808–1825. Old Queens currently houses much of the Rutgers University administration. Camden Campus (or Rutgers-Camden ) consists of five undergraduate, graduate and professional schools, including: Camden College of Arts and Sciences, University College, Graduate School, Rutgers School of Business - Camden and Rutgers School of Law - Camden. As of 2006, 3,696 undergraduates and 1,471 graduate students (total 5,165) are enrolled at the Camden campus. Rutgers, The State University of New Jersey is a leading national research university and is unique as the only university in the nation that is a colonial chartered college (1766), a land-grant institution (1864), and a state university (1945/1956). Rutgers is accredited by the Commission on Higher Education of the Middle States Association of Colleges and Schools (1921), and in 1989, became a member of the Association of American Universities, an organization of the 62 leading research universities in North America. Rutgers-New Brunswick is classified by the Carnegie Foundation as "RU/VH," which stands for Research Intensive University, Very High research activity. Rutgers-Newark is classified by the same organiation as "RU/H," meaning Research Intensive University, High research activity and Rutgers-Camden is given the classification of "Master's M," signifying the university's inclusion in the Master's Colleges and Universities category as a medium-sized institution. Rutgers was ranked 38th nationwide and 54th worldwide in the 2008 Academic Ranking of World Universities by the Institute of Higher Education at Shanghai Jiao Tong University . According to the Washington Monthly's 2006 rankings, Rutgers ranks 53rd in the United States. The Top American Research Universities an annual statistical report by The Center at the University of Florida ranks Rutgers 39th. In the 2009 U.S. News & World Report ranking of American national universities, Rutgers is ranked 64th. In 2003, the Wall Street Journal conducted a study of the undergraduate institutions that most frequently feed students placements at elite professional and graduate programs, such as Yale and Harvard ; Rutgers was ranked 20th in the rankings they compiled for state universities. On a side note, Forbes ranked Rutgers as being the 20th best public university in the United States for "getting rich," as judged by its students' median salaries upon graduation. The Archibald S. Alexander Library, in New Brunswick , is the oldest and the largest library of the University. It houses several million volumes focusing on an extensive humanities and social science collection. It mainly supports the sort of research done in the School of Arts and Sciences, the Edward J. Bloustein School of Planning & Public Policy, the Graduate School of Education, the Graduate School of Social Work, and the School of Communication and Information. Alexander Library also maintains a large collection of government documents, which contains United States, New Jersey, foreign, and international government publications. The Library of Science and Medicine on the Busch Campus in Piscataway houses the University's collection in behavioral, biological, earth, and pharmaceutical sciences and engineering. The LSM also serves as a designated depository library for government publication regarding science, and owns a U.S. patent collection and patent search facility. It was officially established as the Library of Science and Medicine in July 1964 although the beginning of the development of a library for science started in 1962. The LSM currently has two administrative structures since it is a joint library serving both Rutgers and the University of Medicine and Dentistry of New Jersey (UMDNJ). UMDNJ, which was briefly known as Rutgers Medical School, separated from Rutgers in 1970. The current character of the LSM is a university science library also serving a medical school. On the New Brunswick-Piscataway campus, in addition to Alexander Library, many individual disciplines have their own libraries, including alcohol studies, art history, Chemistry, Mathematical studies, Music, and Physics. Special Collections and University Archives houses the Sinclair New Jersey Collection, manuscript collection, and rare book collection, as well as the University Archives. Although located in the Alexander Library building, Special Collections and University Archives actually comprises a distinct unit unto itself. Also located within the Alexander Library is the East Asian Library which holds a sizable collection of Chinese, Japanese and Korean monographs and periodicals. In Newark , the John Cotton Dana Library, the Institute of Jazz Studies (located within the Dana Library), and the Robeson Library in Camden , serve their respective campuses with a broad collection of volumes. Rutgers oversees several museums and collections that are open to the public, including the Jane Voorhees Zimmerli Art Museum, on the College Avenue Campus in New Brunswick , maintains a collection of over 50,000 works of art, focusing on Russian and Soviet art, French 19th-century art and American 19th- and 20th-century art with a concentration on early-20th-century and contemporary prints. The Rutgers University Geology Museum—in Geology Hall next to the Old Queens Building—features exhibits on geology and anthropology, with an emphasis on the natural history of New Jersey . The largest exhibits include a dinosaur trackway from Towaco, New Jersey ; a mastodon from Salem County ; and a Ptolomaic era Egyptian mummy. On the Cook Campus, the New Jersey Museum of Agriculture houses an extensive collection of agricultural, scientific and household tools that spans 350 years of New Jersey's history. The bulk of the collection rests on the 8,000-item Wabun C. Krueger Collection of Agricultural, Household, and Scientific Artifacts, and over 30,000 glass negatives and historic photographs. Also located on the Cook Campus is Rutgers Gardens, which features 50 acres (20 hectares) of horticultural, display, and botanical gardens, as well as arboretums. Rutgers University offers a variety of housing options. On the New Brunswick -Piscataway campus, students are given the option of on-campus housing in both traditional dorms or apartments. Despite some overcrowding, most students seeking on-campus housing will be accommodated with a space, yet in 2008/2009 students were placed in a nearby hotel. The hotel situation is expected to grow into 2009/2010 and students are encouraged to look off campus. Many Rutgers students opt to rent apartments or houses off-campus within the city of New Brunswick. Similar setups are to be found in Rutgers-Newark and Rutgers-Camden, however a substantial portion of the students on those campuses commute and are enrolled on a part-time basis. Rutgers University's three campuses are in the culturally-diverse, redeveloping urban areas (Newark , Camden , and New Brunswick ) with convenient access to New York City and Philadelphia by either automobile, Amtrak or New Jersey Transit. US News & World Report ranked Rutgers-Newark the most diverse university campus in the United States. Because the area of Rutgers' New Brunswick-Piscataway campus—which is composed of several constituent colleges and professional schools—is sprawled across six municipalities, the individual campuses are connected by an inter-campus bus system. Rutgers' motto, Sol iustitiae et occidentem illustra (translated as "Sun of righteousness, shine upon the West also") is derived from the motto of the University of Utrecht in The Netherlands , which is Sol Iustitiae Illustra Nos (translated as "Sun of Justice, shine upon us"). It is a reference to the biblical texts of Malachi 4:2 and Matthew 13:43. This motto appears in the University's seal (pictured above), which is also derived from that of the University of Utrecht, and depicts a multi-pointed sun. At Commencement exercises in the Spring, tradition leads undergraduates to break clay pipes over the Class of 1877 Cannon monument in front of Old Queens , symbolizing the breaking of ties with the college, and leaving behind the good times of one's undergraduate years. This symbolic gesture dates back to when pipe-smoking was fashionable among undergraduates, and many college memories were of evenings of pipe smoking and revelry with friends. During commencement exercises, graduating seniors walk in academic procession under the Class of 1902 Memorial Gateway (erected in 1904) on Hamilton Street leading to the Voorhees Mall where the ceremonies are held for Rutgers College. Traditionally, students are warned to avoid walking beneath the gate before commencement over a superstition that one who does will not graduate. Rutgers hosts over 700 student organizations, covering a wide range of interests. Among the first student groups was the first college newspaper in the United States of America . The Political Intelligencer and New Jersey Adviser began publication at Queen's College in 1783, and ceased operation in 1785. Continuing this tradition is the university's current college newspaper, The Daily Targum, established in 1869, which is the second-oldest college newspaper currently published in the United States, after The Dartmouth (1843). Both poet Joyce Kilmer and economist Milton Friedman served as editors. Also included are The Medium, Rutgers Entertainment Weekly, Rutgers Centurion, a conservative newspaper, the Rutgers University Glee Club, a male choral singing group established in 1872 (among the oldest in the country), as well as the Rutgers University Debate Union. Governed by the Student Activities Council, and funded by student fees disbursed through student government associations, students can organize groups for practically any political ideology or issue, ethnic or religious affiliation, academic subject, activity, or hobby. Rutgers University is home to chapters of many Greek organizations, and a significant percentage of the undergraduate student body is active in Greek life. Several fraternities and sororities maintain houses for their chapters in the area of Union Street (known familiarly as "Frat Row") in New Brunswick , within blocks of Rutgers' College Avenue Campus. Chapters of Zeta Psi and Delta Phi organized at Rutgers as early as 1845. There are over 50 fraternities and sororities on the New Brunswick-Piscataway campus, ranging from traditional to historically African-American, Hispanic, Multicultural, and Asian interest organizations. The New Brunswick campus of Rutgers University has a chapter of the only active co-ed Pre-medical Fraternity, Phi Delta Epsilon, as of 2008. Greek organizations are governed by the Office of Fraternity and Sorority Affairs. Twelve organizations maintain chapters in New Brunswick without sanction by the University's administration. Rutgers has graduated three Nobel Laureates, including Selman A. Waksman (A.B. 1915) in Medicine, Milton Friedman (A.B. 1932) in Economics, and David A. Morse (A.B. 1929), Director-General of the International Labour Organization, who won the Peace Prize in 1969. Several alumni have been awarded the Pulitzer Prize, including Michael Shaara (A.B. 1951), author of The Killer Angels and other historical fiction, in Fiction (1975), journalist Richard Aregood (B.A. 1965) in editorial writing (1985), and Roy Franklin Nichols (A.B. 1918) in history (1949). Alumni of Rutgers have had a considerable impact in the arts, including those by two noted modern sculptors, George Segal (M.A. 1963) and Alice Aycock (B.A. 1968). Many notable buildings in Boston (the Copley Plaza Hotel ), and New York City including the The Dakota , Plaza Hotel , the Waldorf and Astoria Hotels (demolished in 1929 to make way for the Empire State Building ) as well as several of the oldest buildings on the Rutgers University campus in New Brunswick, were designed by architect Henry Janeway Hardenburgh (A.B. 1871). Poet Joyce Kilmer (Class of 1908), attended Rutgers for two years before transferring to Columbia University, was famous for his poem "Trees" and later died in World War I, and Robert Pinsky (B.A. 1962), was appointed Poet Laureate Consultant in Poetry to the Library of Congress in 1997. Filmmaker and critic Wheeler Winston Dixon (Ph.D. 1982) has written more than twenty five books on film history, theory and criticism, and his collected films are housed at The Museum of Modern Art in New York City. In athletics, graduates of Rutgers have won Olympic gold medals, been inducted into sports halls of fame, and led numerous teams as general managers and coaches including Major League Baseball manager Jeff Torborg (B.A. 1963), Eddie Jordan (B.A. 1977), coach of the Washington Wizards, Sonny Werblin (A.B. 1932), founder of the New York Jets, and David Stern (B.A. 1963), Commissioner of the National Basketball Association. Recently, more Rutgers football players have made an impact in the National Football League, with running back Ray Rice (Baltimore Ravens) becoming the first Scarlet Knight to enter the NFL Draft early. Other notable players include Brian Leonard (St. Louis Rams), Shaun O'Hara (New York Giants), L.J. Smith (Philadelphia Eagles), Clark Harris (Houston Texans), Nate Jones (Miami Dolphins), Eric Foster (Indianapolis Colts), Jeremy Zuttah (Tampa Bay Buccaneers), and Pedro Sosa (Miami Dolphins). Yasser Latif Hamdani, Pakistani writer, lawyer, and constitutional scholar is also a Rutgers alumnus. 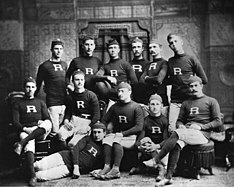 Rutgers was among the first American institutions to engage in intercollegiate athletics, and participated in a small circle of schools that included Yale University , Columbia University and long-time rival, Princeton University (then called The College of New Jersey). The four schools met at the Fifth Avenue Hotel in Manhattan on 19 October 1873 to establish a set of rules governing their intercollegiate competition, and particularly to codify the new game of football. Though invited, Harvard chose not to attend. In the early years of intercollegiate athletics, the circle of schools that participated in these athletic events were located solely in the American Northeast. However, by the turn of the century, colleges and universities across the United States began to participate. Rutgers Scarlet Knights fullback No. 23 Brian Leonard (class of 2007), conducts the band as it plays the school song, 'On the Banks of the Old Raritan' after his last home game against Syracuse University on November 25, 2006. 1991, Rutgers is a member of the Big East Conference, a collegiate athletic conference consisting of 16 colleges and universities from the East Coast and Midwestern regions of the United States. The Big East Conference is a member of the Bowl Championship Series. Rutgers currently fields 27 intercollegiate sports programs and is a Division I school as sanctioned by the National Collegiate Athletic Association. Rutgers fields thirty teams in NCAA Division I sanctioned sports, including Football, Baseball, Basketball, Crew, Cross Country, Fencing, Field Hockey, Golf, Gymnastics, Lacrosse, Soccer, Softball, Tennis, Track and Field, Swimming and Diving, Wrestling, Volleyball. Most recently, the Rutgers Scarlet Knights' football team has achieved success on the gridiron after several years of losing seasons, being invited to the Insight Bowl on 27 December 2005 in which they lost 45 to 40 against Arizona State University . This was Rutgers' first bowl appearance since the 16 December 1978 loss against Arizona State, 34–18, at the Garden State Bowl. The 2006 football season also saw Rutgers being ranked within the Top 25 teams in major college football polls. After the 9 November 2006 victory over the #3 ranked, undefeated Louisville Cardinals , Rutgers jumped up to seventh in the AP Poll, eighth in the USA Today/Coaches poll, seventh in the Harris Interactive Poll, and sixth in the Bowl Championship Series rankings. These were Rutgers' highest rankings in the football polls since they were ranked fifteenth in 1961. Rutgers ended the season 11–2 after winning the inaugural Texas Bowl on 28 December 2006, defeating the Wildcats of Kansas State University by a score of 37–10 and finishing the season ranked twelfth in the final Associated Press poll of sportswriters, the team's highest season-ending ranking. Rutgers maintains athletic rivalries with other collegiate institutions. The university has historic rivalries with Princeton University , Columbia University (formerly King's College), Lafayette College , Lehigh University and New York University originating from the early days of college football. While they maintain this rivalry in other sports, neither of them have met in football since 1980. Rutgers has a basketball rivalry with Seton Hall University , and has developed a growing three-way rivalry with the University of Connecticut and Syracuse University , both fellow Big East Conference members. Note: Of the nine colonial colleges, seven (Harvard, Yale, Pennsylvania, Princeton, Columbia, Brown and Dartmouth) remained private, and of the two remaining, William and Mary was taken over by the Commonwealth of Virginia and reincorporated as a public institution in 1888, and Rutgers became the State University of New Jersey by acts of the state legislature in 1945 (Public Law 1945, chapter 49, page 115) and 1956 (Public Law, chapter 61) now enshrined as New Jersey Statute 18A:65-1 et seq. Top 500 World Universities (2008) Institute of Higher Education, Shanghai Jiao Tong University. Accessed 14 September 2009. Getting to Know Rutgers from the Office of Undergraduate Admissions website, published by Rutgers, The State University of New Jersey (no further authorship information available), accessed 25 January 2007. And then there was Rutgers... in The Daily Targum 8 November 2002, accessed 12 August 2006. A Historical Sketch of Rutgers University by Thomas J. Frusciano, University Archivist, accessed 12 August 2006. A Charter for Queen's College in New Jersey (1770) in Special Collections and University Archives, Archibald S. Alexander Library, Rutgers University, New Brunswick, New Jersey. Paths to Historic Rutgers: A Self-Guided Tour, at Rutgers University, accessed 9 August 2006. N.J.S.A. 18A:65-1 et seq. (Public Law 1956, chapter 61) repealing and succeeding P.L. 1945, c.49, p.115. accessed 8 August 2006. Commission on Health Science, Education and Training: Rutgers Targeted Assesment accessed 15 August 2006. Rutgers: Members of the Board of Trustees accessed 15 August 2006. Rutgers:Members of the Board of Governors accessed 15 August 2006. "A View from the Inside" (an interview with Dr. Richard P. McCormick) by Thomas J. Frusciano in Rutgers Magazine" (Winter 2006), accessed 16 August 2006. Rutgers:Governing Boards of the University accessed 15 August 2006. Note: Rutgers is the only one of the original nine colonial colleges to satisfy all three categories. Seven of the colonial colleges remained private institutions. Of the two that became state institutions, Rutgers and College of William and Mary, only Rutgers was named a land-grant college. Top 500 World Universities. Shanghai Jiao Tong University. Accessed on 15 August 2006. The Top American Research Universities accessed 21 October 2006. Want to Go to Harvard Law?. The Wall Street Journal. Accessed on July 20, 2008. Top Public Colleges for Getting Rich. Forbes. Accessed on August 22, 2008. UCSB website citing 2001 U.S. News & World Report Data, accessed 15 August 2006. UVA website citing April 1, 2005 U.S. News & World Report data and rankings, accessed 15 August 2006. St. Olaf College webpage citing 1998 U.S. News & World Report data and rankings, accessed 15 August 2006. Suny Stony Brook webpage citing Nov./December 1998 issue of Science Watch and other data, accessed 15 August 2006. Law Rankings Accessed 27 July 2007. Rutgers Business School News Accessed 12 November 2006. The Philosophical Gourmet Report accessed 15 August 2006. "Philosophy Department rated number one" by Steve Manas, article from 18 November 2002, accessed 15 August 2006. America's Best Colleges 2007 from U.S. News and World Report, accessed 18 November 2008. CollegeBoard.com college comparison, accessed 22 October 2006. Rutgers University Libraries: Library Facts & Figures accessed 8 August 2006. ALA: The Nation's Largest Libraries accessed 15 August 2006. Zimmerli Art Museum: Collections accessed 8 August 2006. Rutgers University Geology Museum accessed 8 August 2006. New Jersey Museum of Agriculture accessed 14 August 2006. Rutgers Gardens: A Message from the Director accessed 10 September 2006. Tradition at www.scarletknights.com (New Brunswick, NJ: Rutgers University). Accessed 10 September 2006. King James Bible, Book of Malachi, Chapter 4 verse 2: "But unto you that fear my name shall the Sun of righteousness arise with healing in his wings; and ye shall go forth, and grow up as calves of the stall." and King James Bible, Gospel According to St. Matthew, Chapter 13, verse 43: "Then shall the righteous shine forth as the sun in the kingdom of their Father. Who hath ears to hear, let him hear." Presidential Inauguration: Inauguration Pageantry and Color accessed 9 September 2006. Office of Fraternity and Sorority Affairs at Rutgers University, accessed 9 September 2006. Office of Fraternity and Sorority Affairs at Rutgers University, accessed 9 October 2008. Registered Fraternities and Sororities Office of Fraternity and Sorority Affairs, Rutgers University, accessed 9 September 2006.
at Alumni News & Events: Rutgers Hall of Distinguished Alumni, published by Rutgers, The State University of New Jersey (no further authorship information available). Accessed 25 January 2007. A History of American Football until 1889 accessed 10 September 2006. Rutgers Through the Years Timeline at Rutgers University, accessed 12 August 2006. NFL History at the National Football League website, accessed 10 September 2006. College Football Past National Championships at the National Collegiate Athletic Association website, accessed 29 December 2006. Rutgers football history database at NationalChamps.net, accessed 3 January 2007. Rutgers at BigEast.org Official Site of the Big East Conference. Published by the Big East Conference (no further authorship information available). Accessed 12 January 2007. "Discography" from Failure Magazine, accessed 4 August 2006. 1976 NCAA Division I Basketball Tournament at shrpsports.com, accessed 29 December 2006. Big East Championship Records published by the Big East Athletic Conference, accessed 8 August 2006. "Rivalry Rising: With both teams lagging behind in the Big East, a new coach looks to revitilize Rutgers-Seton Hall" by Brian Johnson in The Daily Targum (26 January 2007). Accessed 28 January 2007.